Oakland, California must be a pretty awesome place to live, because it seems like everyone there is living the high life; including the trio that makes up punk/sludge metal ensemble, Connoisseur. The band have amassed a solid following since their formation in 2011, and they've released a full-length every year since up until 2014. This year has witnessed the first EP from the group, Stoner Justice. Having been released on cassette, the material has a primitive analog edge to it that creates an appropriate thick, smoky atmosphere. "Circle of Heads" is a straight up punk assault, comprised of power chords in a simple rhythm hook and galloping drum beats. Despite the muffled low grade audio quality, each element is able to make a noticeable impact throughout the content and the bass can be heard clearly plugging away in the background with grooving thuds. The guitar has a nice, gritty flavor to it and lugs the entirety of this track with fast punk patterned chords. "Circle of Heads" and "Full Blown Marijuana Addict" are the only two tracks that come in above the three minute mark, "I Am the Weed" coming in at just over a minute and a half, and the other tracks are mere seconds in length. While "Circle of Heads" is geared towards the punk side of Connoisseur, "Full Blown Marijuana Addict" appeals to the sludge craving fiends. Much more docile in tempo, the song is carried almost by the bass alone, displaying just how deeply twangy the instrument is. 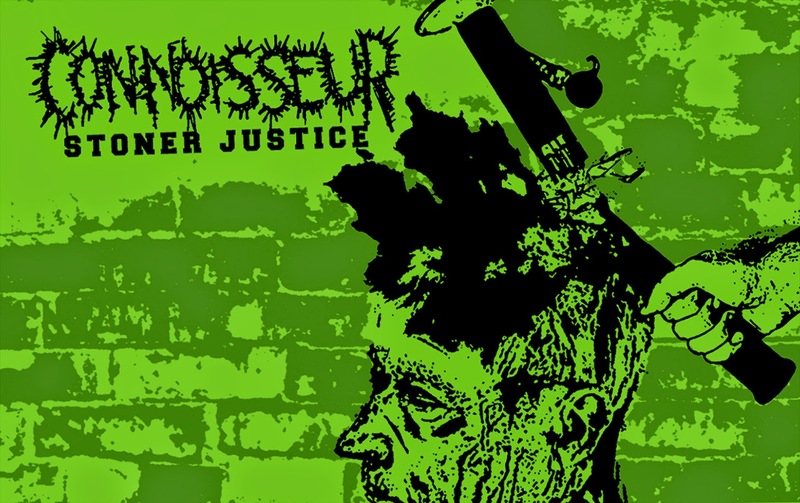 The perfect cassette to throw on when you're either low on dope or sick of that guy who's always hitting up your joints without giving back, Connoisseur have rolled up a fat one with Stoner Justice. While there's nothing incredibly groundbreaking here, the offsetting fusion of punk and sludge styles go well together, and the band have a knack for fun riffage. Though the drums fail to make much of an impression, there's not much room for growth other than pulling away from the typical punk patterns and blast beats during the faster compositions. Overall, a great listen and what's even better is that it's available to you at the low, low price of free over at the Tankcrimes Records Bandcamp page.